Please note: This picture was NOT taken in the Catskills. This images was taken out west. 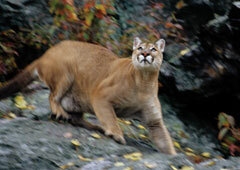 There is NO believable images of a cougar taken in New York State. We included this picture to show what a cougar looks like. Location: Kaaterskill Creek in between Lake Creek and Buttermilk Falls on the north side of old Rt 23a. Print Width: 3" to 3-1/4" wide. Toe Shape: tear drop in shape. The prints are in a deep valley. The valley is about 100-200' wide with very steep side walls 40-70 degrees. A great kill zone for a cougar. Lots of deer use this valley to move from one region to another. This area was notorious for cougars back in the 1700's and 1800's. We also had a tree that had unusual scratching. 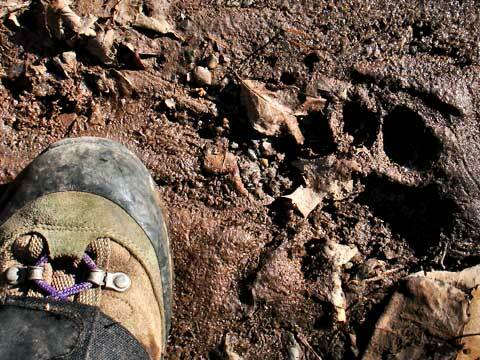 Hunters didn't think that a bear did the scratching. But, they didn't know what to think of it. I do have a picture. Hunters complained that this region has been a regular deer hunting region that has produced good deer. This year, they complained that there were very few deer in this region. They found it strange that they were missing. It should be noted that black bears commonly scratch trees and telephone poles in the clove, so we cannot say that this tree scratching is from a cougar. But, scratching did occur up to 20 feet up the tree. We had two reports of cougars about 25 miles away this summer. But, since I didn't see it I always question it. But, this person used to live in Montana, and knows what they look like. One was located crossing Rt 23 in East Windham. A possible cub was sighted in Oak Hill. 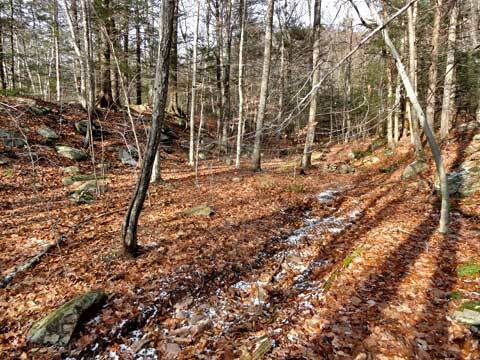 A year ago, one was reported crossing Rt 214 near Stoney Notch, tracks were seen crossing the Devil's Path and over near Huckleberry Point. Pictures of the prints were sent to Reputable Cougar Experts for comments about the prints. No one has disputed that they are not cougar prints. The prints were seen moving from the Northwest to the Southeast. The prints moved in one direction. This section of land was blocked from animal movement because of the storm on December 1. The creeks were 30-100' wide and raging. This section of Kaaterskill Creek is considered a Class V water. The only animal that could move in-and-out of the area is a cougar. We did consider that this was an extremely large Bobcat. The prints do not match a bobcat. Most bobcats were killed last Winter in the Feb/Mar snow storm, where this region received 7-8' of snow. Since that time there are only 3 known bobcats in the Catskills. One was located in the Spruceton Valley; Second was on KHP; Third was killed on Rt 23 in East Windham. Never-the-less, we searched the region for the existence of one. None were found. The one on KHP was a small bobcat. We also setup trail cams looking for existence of a bobcat, and none were found. There is no reasonable argument or reason to consider these tracks to be a Bobcat. There are some differences between a bobcat and a cougar. The differences point to a cougar. The first natural consideration was that this could be the large coyote that has seen on the Eastern Escarpment over the past couple of years. This large coyote usually runs with other coyotes, but not always. We do have prints from this large coyote. Coyotes outer toes have an angle greater then 30 degrees. Doesn't match these prints which are 15 degrees. Coyotes have nails, and these prints done. Coyotes have an oval print, where this print is round. 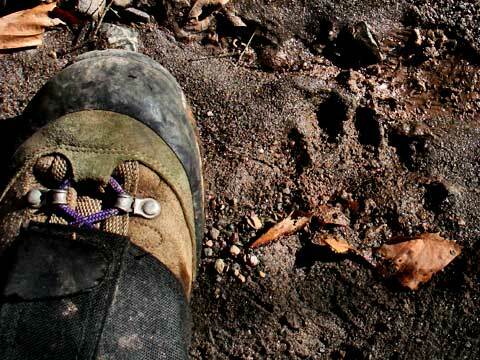 Coyotes have dirt kickup, and these prints don't. We are sure that these prints are not from a cougar. Attack zone #1 of coyote. About 100-200' from the ambush location. Note the white fur, that is often found on the underside of the neck of coyotes. Final kill zone. Please note, we never found the bones of the coyote. We also found a deer kill. But, it was close to Rt 23a. So, we question if this deer was killed by a cougar. 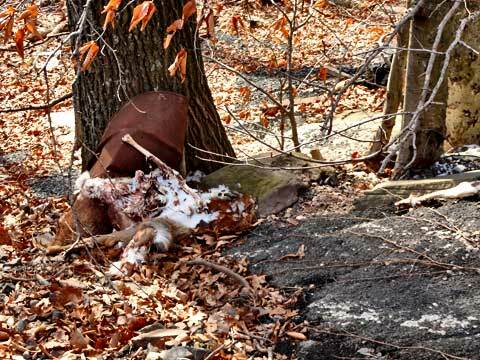 Killed Deer near Rt 23a - May not be a cougar kill. I don't think it could be a bear. They have 5 toes with nails. I think coyotes have a different shape of the 4 toes and have nails. I have to say that the prints are huge! Do you think that it is still down there? From what we can see it was passing through. It might have been there for a short period of time. But, this type of behavior appear to be fairly typical. Looks like a bobcat paw the size isn't even remotely close to that of a cougar. 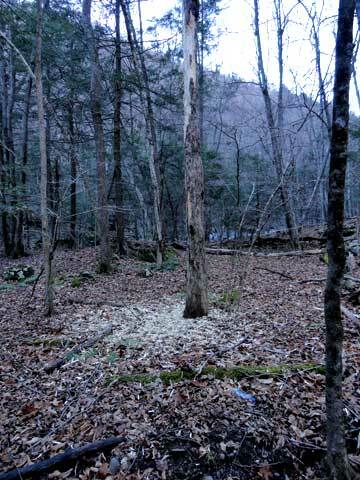 As far as the tree picture goes, Looks like Porcupines got hungry and ate the bark. And onto the hunters... Maybe there are less deer because every year they come in and shoot and kill deer in that region and its loosing some of its population? And im sure other things aside from a cougar could kill a coyote and deer. The original post states that 50 prints were found. 3 of those prints are shown above are in dirt. There are 2 images of coyote prints in the snow. Bobcat can have prints up to 2-1/4", where these prints are 3 to 3-1/4". Female cougar prints are from 3-4". The post also states that they contacted leading cougar experts and none of them are disputing that the prints look like a cougar. 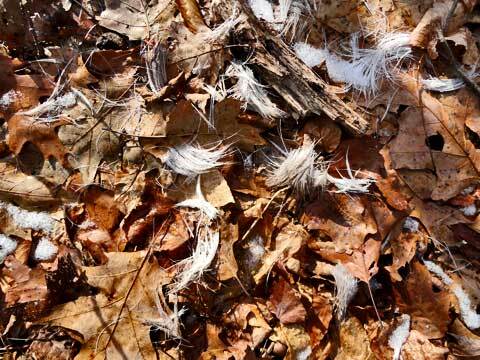 It is well known that most of the Bobcats died last winter after the 7-8' snowstorm. 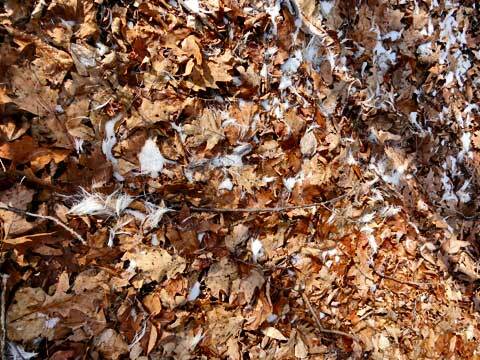 They did look for bobcat dens, and found one on KHP which was a average sized bobcat. We don't want people fighting over this subject or any other subject on the forum. We do realize that this is a "hot topic" where opinions and beliefs can be strong. It should be noted that the subject of cougars (sometimes called Panthers, Mountain Lions, etc) has been long discussed in New York. To my knowledge this subject has been debated for close to a decade. Some of these debates have been very hotly discussed and argued. There are also some groups who are "hell-bent" on proving that there are cougars in New York. Some of these groups have fabricated evidence to "prove" their point. On the other hand, there have been groups that are "hell-bent" on proving that cougars don't exist. Then we have the DEC who have been accused of releasing 11 cougars north of the Catskills in 2001. Whether you believe this accusation or not, is up to you. There are a lot of politics involved in this subject. Our position is that we are just going to present the evidence and let people develop their own opinions. We also hope that we can get biologist to present possible explanations and comments to further a constructive conversation of the possibility of cougars in New York. Will this change anything in New York concerning Cougars? The simple answer is no. Until we have proof that we have a viable pair of cougars successfully reproducing a viable population nothing further will happen. And, rightly so. Stray cougars in New York are not new. Some people obtain them from other regions and illegally keep them as pets. Once the cubs start to grow up, they become unmanageable and dangerous. They then get dumped in the Catskills or ADKs. It is also possible that cougars from the mid-west could stray as far as New York. Biologist also acknowledge that eventually cougars will migrate into New York from the Midwest. It is only a matter of time. You can also get escapees from zoos and other organizations. But, until we have a pair of cougars successfully reproducing in New York, we cannot consider them part of our region. Moose went through the same process. We did have biologist respond to the post. The most likely match would be a bobcat. 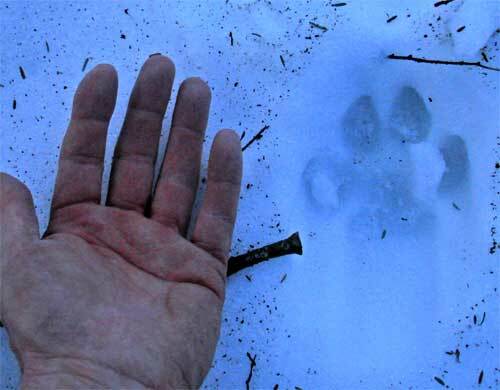 While those same biologist also acknowledge that the prints are way too large to be a bobcat. But, there have been very rare cases where biologist have found very large bobcats. 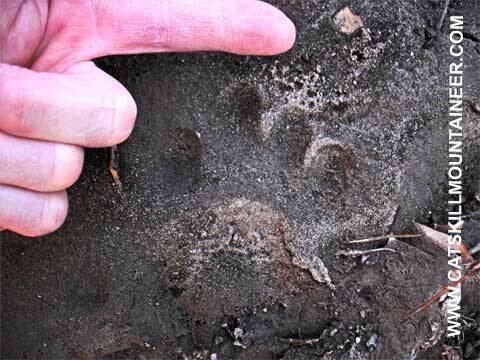 But, these very large bobcats are still half the estimated weight of the animal that made these prints, and their prints would not match the size of the prints we posted. We and some other biologist spent well over a hundred hours searching the region for bobcats. Only one was found, which was in the 20-25 lb range with 2" prints. 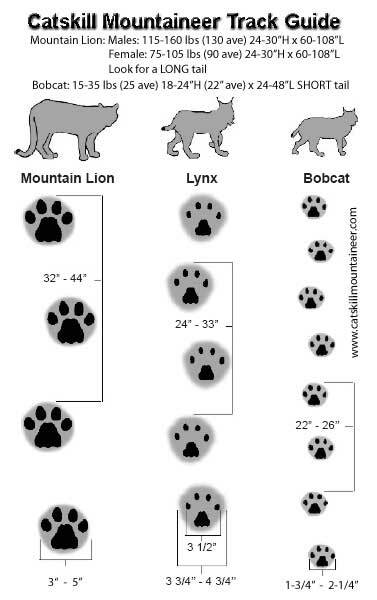 Additionally, there are differences between Bobcat prints and Cougar prints. These prints did not match a bobcat. Excluding Bobcats as a possibility was done. An extensive amount of work was carefully done. We feel confident that the prints are not of a bobcat. But, we would not object to reopening this possibility if reasonable evidence was presented to us. We don't want to be close-minded. Another possibility was presented. This second possibility was an illegally released Lynx. Lynx naturally existed in the Catskills pre-1900. The Catskills do have an abundant amount of rabbits where the ADKs don't. Some believe that they could survive in the Catskills. But, we can exclude them because their toes are much smaller then the prints we found. Even if the size of the prints are equal. Additionally, the stride is different. The stride matches a cougar, and not a Lynx. We feel confident that the prints are not of a Lynx. We do want to remain open minded to other possibilities and reasonable comments. These prints are significant because no one has presented prints of cougars before in New York. Or, at least to our knowledge. If I recall, the Lynx release project failed because there were not enough rabbits for them in the ADKs. There are a lot more rabbits in the Catskills, and maybe they could survive here. But, these prints definitely are not Lynx prints. The toes are too big to be a lynx. Coyotes in the northeast are already part wolf and part coyote. They did DNA test, and proved that they are part wolf. This is why they are larger in the northeast. I have seen a couple very large coyotes in the Catskills. They usually run in small packs. Weren't there a lot of lynx in the catskills back in the 1800's? Yes, the Catskills had a good population of Lynx. Bobcats and Lynx were heavily pursued by trappers and hunters.